Happy birthday to us, presents for you! It might be our birthday, but the presents are for you—and your students! 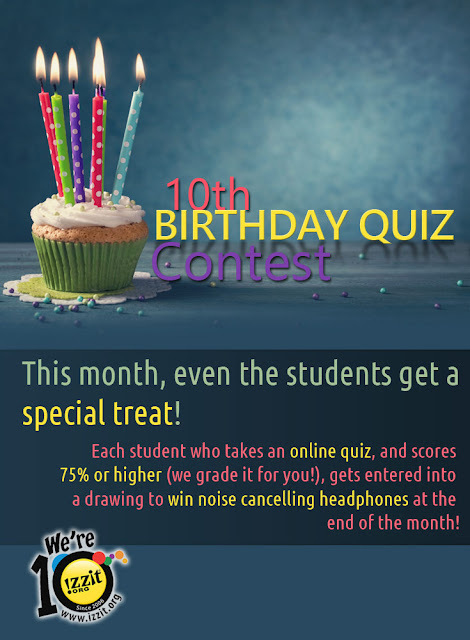 We didn’t want to leave the students out of the celebration, so each month, when your students take one of our online quizzes (you must set up your classes so they can do this—log in to your account, go to the My Account Page, and click the QUIZZES button. You’ll find a How To video to demonstrate the complete process!) and score a 75% or higher, they’ll be entered to win a pair of Boompod headphones. One eligible winner will be randomly selected each month. Last Call For October izzit.org Contests! New Release - Sustainable Oceans & Seas!